He might have found faults with many an Indian cricketer but former Australia wicketkeeper Adam Gilchrist has admitted he 'was wrong' in claiming Rahul Dravid's wicket during the fateful Sydney Test.Gilchrist said he had wrongly appealed for Dravid's scalp after he genuinely thought the Indian had nicked the ball but defended himself by saying that he was not a "cheater" with "an ugly win-at-all-costs attitude". 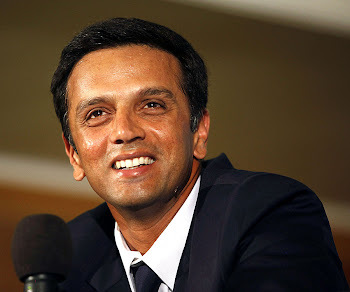 "The Dravid decision was a howler, but to this day I would not have acted any differently. It happened very quickly, there was a noise, the tension was high, I thought he'd hit it. We all went up," he wrote in his autobiography 'True Colours'. "To feel the ball coming into my gloves at slightly deflected angle, having heard the noise, I wasn't 100 per cent sure of course; but there was a good chance he'd hit it, so I appealed. "...I appealed for something which I genuinely thought was out, and then replays showed it wasn't. It may have come as a surprise to Peter Roebuck and other critics, but I was not perfect. I did not have slow motion, Hawkeye, hot-spot vision. I thought Dravid had hit it. I was wrong!" he admitted. On the fifth day of the Sydney Test, Dravid had batted two and a half hours for 38 before he went forward to a Andrew Symonds off spinner which Gilchrist thought was edged to him. "I went up, we all went up, and the umpire gave him out. Replays would show that the ball and his bat had grazed his pad, and he hadn't hit it. Roebuck had a problem with me because of the manner of Rahul Dravid's dismissal," Gilchrist said. The former stumper, in his book, took a dig at Sachin Tendulkar, hinting that the Indian maestro was a sore loser besides questioning the commitments of Sourav Ganguly and Harbhajan Singh during their 2004 series. Gilchrist also said the happenings during India's trip Down Under in 2007-2008 tarnished Australia's reputations to the extent that his honesty too got dragged into the line. "Now I was being accused of being a bad sport, for claiming the catch. This was great example of what some of my teammates had warned me about; that my principled stance on walking would be used to beat me with. "...according to Roebuck and others, I was part of an ugly win-at-all-costs attitude. I dropped my standards to the point where I was, basically cheating." Gilchrist, one of the most successful wicketkeepers in the world, felt the Sydney Test also had a bearing on how the third Test at Perth would go. "There were crucial moments in Perth when we hesitated, and I felt it cost us initiative in the match... The Indians lapped it up in the field. Knowing that we were the ones under pressure for our behaviour, they went in hard and aggressive, thinking it would not matter what they did. "We felt like we were playing with one hand tied behind our backs, if only because of mixed messages about restraining our aggression. The Indians were less inhibited," he said. How do you feel after reading this? I can still remember the anger filled in every Indian's mind after the controversial Sydney test.If Gilly wouldn't have appealed against Rahul, it was quite clear that the match would have been a tie.Nevertheless, Gilly has at last accepted his mistake through his "True colours".